This simulation helps explain an odd light signal thought to be coming from a close-knit pair of merging black holes, PG 1302-102, located 3.5 billion light-years away. 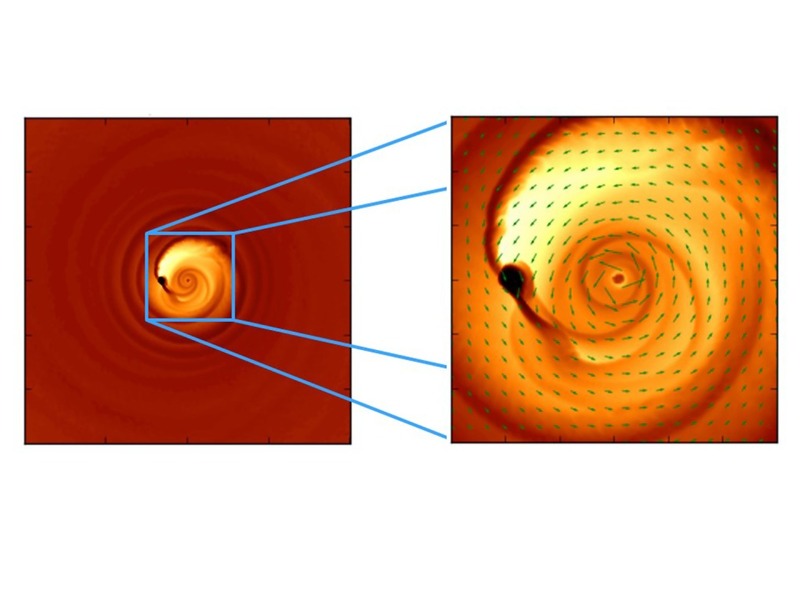 The close-up view at right shows that the smaller of the two black holes gives off more light (left side of picture). While the black holes themselves don't emit light, they accumulate and heat up surrounding gas, which then radiates light. The reason the smaller black hole gives off more light is that it is orbiting farther from the center of mass and closer to the surrounding gas disk, allowing it to gather up most of the gas as it orbits. The result is that the more massive central black hole is starved of gas and doesn't glow as brightly. As these black holes orbit around each other, they are thought to send out a varying light signal. The signal was detected by astronomers using telescopes on the ground and in space. The simulation comes from Brian Farris of Columbia University and New York University, both in New York City. The image comes courtesy of Zoltan Haiman, Columbia University.